THE MACCA LODGE colours were in the winner’s circle for the first time this season when three-year-old Panspacificflight filly Sally Maclennane broke through maiden ranks at Gore on 23 August. After making a mistake when well-supported in her first run for the season at Invercargill a fortnight earlier, Sally Maclennane was eased out of the gate by John Dunn in the 2200-metre event. She made a run three-wide with a round to go before pressing on to lead at the 600-metre mark and holding on gamely to win in 2:49 neat. The McIntyres leased her dam, the Badlands Hanover mare Weka Lass, from owner Leicester Smith for a season to put to Panspacificflight. Sally Maclennane, who trialled in 1:58 as a two-year-old, is the second winner from her sire’s second crop here behind quality filly Arden’s Choice. Weka Lass, who is out of the big winner Oaxaca Lass, has also left a full-sister to Sally Maclennane called Reciprocity. Macca Lodge trainer Tony Stratford made it two wins for the day when Ultra Shok backed up his Invercargill effort with the seventh win of his career. The seven-year-old Julius Caesar gelding has won $10,500 from three starts this month and should be in for his most profitable season yet. BONNIE’S KHALEESI was named the Southland Standardbred Breeders’ Three-Year-Old Filly of The Year at Southland harness racing’s awards night in Invercargill. The Live Or Die mare, now four, also won the won the Robin Dundee Three-Year-Old Filly Award after recording two wins, two seconds and a third, for $16,000 in stakes, last season. She was also a luckless seventh in the Nevele R/Macca Lodge Southland Oaks Final. Bonnie’s Khaleesi is raced by her breeders, Macca Lodge’s Sheree and Brent McIntyre, his sister Jan Nelson and her husband Wally. She’s out of the good mare, Bonnie Lass, who won 10 races for the two couples. Another Tony Stratford-trained horse, Envious, won the Southland harness award for two-year-old fillies. And Panspacificflight filly Arden’s Choice won an Award of Excellence for her two-year-old campaign. MACCA LODGE’S Brent McIntyre wasn’t surprised that Panspacificflight left a two-year-old last season as good as Group 1 winner Arden’s Choice — after all, he’s produced something like 120 two-year-old winners in North America and the number just keeps on increasing. Take the other day, 15 August, at Hoosier Park in Indiana. Panspacificflight provided three two-year-old winners on the one programme, as well as a couple of placegetters. Ticket To Fly won a $US15,000 two-year-old fillies race in 1:53.4 with a final quarter in 28.1. Another filly, Made of Jewels As, also won, in 1:55.1, with a second Panspacificflight runner, Sandy’s Flight, third in the same race. And Paver Jack scooted over his final quarter in 27.3 to win a $US10,000 race in 1:56 with Flight of Siam in third place. MACCA LODGE is getting in behind the New Zealand Metropolitan Trotting club’s efforts to attract more southern-trained horses to Addington during Cup Week. Horses from the south have traditionally played a significant role in the biggest harness racing carnival of the year, but their numbers have been tending to drop off. So last year, on Show Day, the Met programmed a race solely for horses trained in Otago and Southland and called it “the South of the Waitaki River” race. It drew a strong field and was won by the Tony Barron-trained Phoenix Warrior. The Met have decided to programme the $20,000 race again this year with Macca Lodge as the sponsor. And this November southern commentator Dave McDonald will be calling the race. The club built on this idea with a “South of the Waitaki” winter series in which Panspacificflight gelding Wick won two heats and finished second in the final. The four-year-old gelding came off the unruly position in a 2200-metres standing start event to win easily in the hands of Brent Barclay. Dunedin trainer Graeme Anderson paid $25,000 for the son of Artiscape mare Madam Maroussia at the 2012 yearling sales. 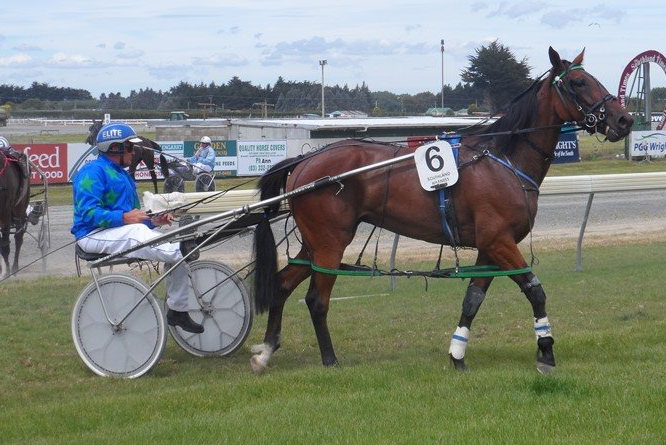 He remains in the ownership but the horse is trained by Matt Saunders at West Plains, near Invercargill. Arden’s Concord became Panspacificflight’s 11th winner from a first crop of 23 live foals, giving the stallion a winning percentage of nearly 48 per cent. WATTLEBANK FLYER became Panspacificflight’s 10th individual three-year-old winner when he won at Addington on 24 July. The Tim Trathen-owned and trained gelding broke through for his maiden win in the hands of Blair Orange on the same night that Wick recorded one of his three Addington wins. This was the second time Panspacificflight had two wins from two starters at the home of harness racing after both The Manipulator and Arden’s Choice won at the same meeting in April. Wattlebank Flyer’s success gave his sire a 43 per cent winning record for the season from his first crop. This figure includes two of his Australian performers, Glenisla (seven wins) and Sir Macs Man (four wins), who didn’t win here before they were exported and, therefore, aren’t included in the Harness Racing New Zealand statistics. Coincidentally, Panspacificflight also has a 43 per cent strike rate in North America, where his 193 winners have come from 447 foals. Panspacificflight was 10th on the list of sires of three-year-old pacers here last season. Whichever way you look at it, his statistics are most impressive. All the sires ahead of him had at least twice as many foals — and, in the case of champion sire Bettor’s Delight 10 times as many — but none had a percentage higher than 43. Panspacificflight’s close relative Art Major was the best of them with 34 winners from 85 foals for a strike rate of 40 per cent. Of the others in the top 10, Bettor’s Delight had 33 per cent winners, American Ideal 21 per cent, Mach Three 30 per cent, Changeover 18 per cent, Christian Cullen 28 per cent, McArdle 22 per cent, Gotta Go Cullect 14 per cent and Live Or Die 11 per cent. And among those behind Panspacificflight (remember he had 10 winners as three-year-olds from 23 foals) in the rankings, look at these statistics: Gotta Go Cullen, eight winners from 37 foals; Jereme’s Jet, five from 40; Shadow Play, three from 19; Stonebridge Regal, 10 from 82; Elsu, six from 87; Santanna Blue Chip, eight from 52; Badlands Hanover, six from 72, Courage Under Fire, five from 23; Falcon Seelster, four from 48; Art Official, six from 49; Grinfromeartoear, four from 33; Washington VC, four from 45; Ohoka Arizona, three from 25; Real Desire, two from 34; Sands A Flyin, one from 26; Lis Mara one from 37; Extreme Three, none from 60; Flashing Red, none from 28; and Royal Mattjesty, none from 24. Compelling reasons to consider Panspacificflight for the 2015-16 breeding season.